This year, monies were raised through restaurant fundraisers, shirt sales, ticket sales and donations raised by all participants and active members of the fraternity. All proceeds go directly to Big Brothers Big Sisters of Southwestern Illinois. Big Brothers Big Sisters focuses on matching children who are facing adversity - “Littles” - in the community with mentors - “Bigs” - who provide social, emotional and academic support. Overall, Bigs serve as role models for their Littles with the goal of building a strong foundation for successful lives. The Big/Little program is available throughout Madison County, as well as Clinton, Monroe and St. Clair Counties. Since 1980, Big Brothers Big Sisters of Southwestern Illinois is a nonprofit organization with a mission to provide children facing adversity with strong and enduring, professionally supported 1-to-1 relationships that change lives for the better, forever. A proud member of the United Way, the organization partners with parents/guardians, volunteers and others in the community and hold itself accountable for each child in the program in achieving higher aspirations, greater confidence and better relationships, avoidance of risky behaviors, and educational success. Learn more about our vision to ensure all children achieve success in life by visiting www.bbbsil.org or call (618) 398-3162. 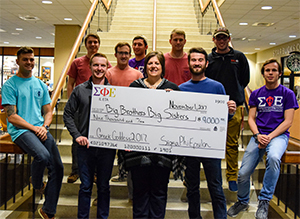 Photo: Members of the Sigma Phi Epsilon present $9,000 check to Natalie Jablonski, President & CEO of Big Brothers Big Sisters of Southwestern Illinois.